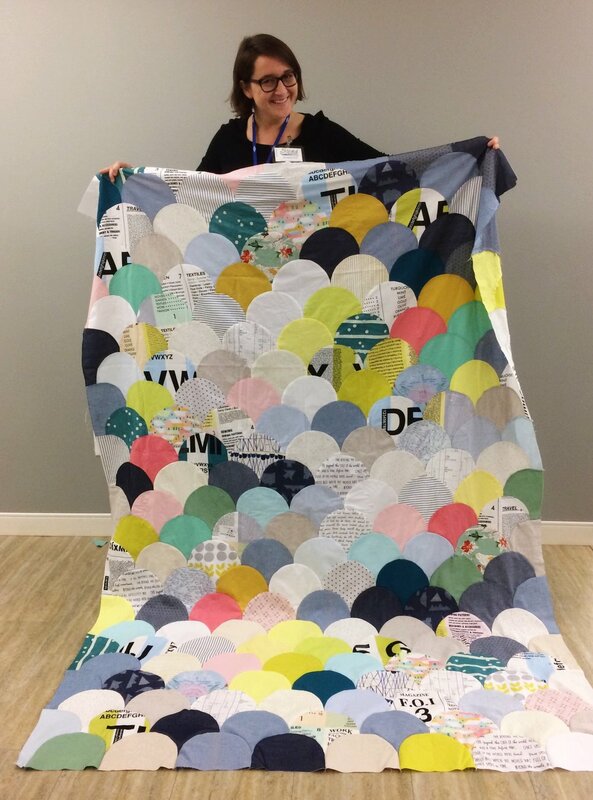 In the summer of 2016 I was lucky enough to attend a workshop taught by Latifah Saafir, hosted by my guild, Chicago Modern Quilt Guild. I love all of Latifah's work, and her glam clam pattern is brilliant. I had fun picking out colors for this quilt. I wanted lots of candy colors, some pops of neon,denim, and some text prints. In picking my fabrics I studied one of Latifah's quilts, Neon and Neutral, that I have long admired. Her quilt inspired me to include the pops of neon and the text fabrics. Also, Kona announced Highlight as their color of the year in 2016. I was seeing it everywhere and I wanted to try my hand at using it. It was amazing to use a die-cutter to cut all the clamshell pieces. It was my first time using one. I was able to borrow a guild-mate's cutter at a sew-in. Cutting these shells was so quick and easy with that tool. I tried to make the layout pretty random, but with little clusters of color throughout the quilt. I'm so pleased with how this quilt looks. Clamshell quilts are so classic but I feel like the colors and prints here are really fun and fresh. This quilt just makes me happy. That's why I named it Happy as Larry. It's sort of a play on "happy as a clam." That seemed too on the nose, so I opted for another phrase that means the same thing. I first heard the phrase "happy as Larry" in the movie Strictly Ballroom, a mega-favorite from my youth. Piecing the clamshells, row after row, can become a little tedious, especially as the quilt grows. By the last few rows I felt like I was really wrestling a beast under the needle. I felt so triumphant when I finished piecing this top. I had to celebrate. I finished this top at a Chicago Modern Quilt Guild retreat weekend, the perfect place to knock out a project. Mitch Hopper took these photos of the final quilt for me. Nikki Maroon quilted it. Simple curves and grids, as per my request. I tried something new for the back of this quilt. Society6 is a website where artists can upload their images, and customers can purchase them printed on a variety of products. So I ordered their product called a wall tapestry, with an image from a collage artist I've been following for several years, Ben Giles. The fabric is polyester, but it quilted up nicely, and I love the fun image on the back of the quilt.